“You’re going alone?” That was the overwhelming response in the lead up to my inaugural solo overnight hike. Some people seemed perplexed by my craving for solitude. Others expressed concern, fuelled by folklore of the harsh Aussie bush or imagined threats from menacing Milat-style nutters lurking out in the wilderness, apparently just waiting for me. About two weeks out from the hike I started having dreams about getting lost. They were random meanderings and contexts – mostly urban – but the underlying navigation trepidation was apparent. It wasn’t until a week later when I found myself articulating to others how and why I’d chosen this particular walk that I calmed down and realised I felt relatively prepared. The Coorong is an area where the mouth of the Murray River greets the Southern Ocean. 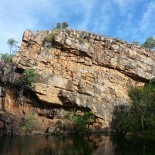 A bunch of saltwater lakes and lagoons are nestled between the beach sand dunes of the Younghusband Peninsula and a stretch of the Princes Highway, along which every second vehicle is a 4WD towing a caravan. When there is water around, this is an abundant breeding ground for migratory birds. Pelicans play here. Cue Storm Boy. From the basic map I’d decided that the Nukan Kungan walk didn’t seem too rugged or remote. The 25km (one-way) route appeared to be intuitively linear and it traversed 4WD tracks and short duration day walks, so I felt mildly confident that civilisation wouldn’t be too far away if things went awry. I’d also banked on local knowledge from the Salt Creek General Store. Alas, there wasn’t a thing that friendly German backpacker behind the counter could tell me, other than to beware of snakes. I was more wary of navigation ineptitude, so I opted to concentrate and not take pictures on the first leg. I also wanted to take it all in and experience it, rather than catalogue it first up. About an hour in, I officially crossed the trail threshold as it veered away from the Lakes Nature Walk Loop. Pretty soon I burst into tears. Even though the lakes were cracked dry the edges were teeming with succulent plants displaying hues of pink, brown and green. There was an amazing beauty and stillness that overwhelmed me. I think it was also a release of the pre-walk build-up and the culmination of ideas coming to fruition. I’m often very good at saying or starting things. But even though I was completely bluffing my way through, here I was actually doing it, elated and kicking off a new phase of my life. About seven hours later I was almost in tears again – this time tired, exhausted and just wanting to bloody well reach the 42 Mile Crossing campsite as the coastal wind fought me for my hat. Most of the day the trail had been reasonably well sign posted. There were also trail bike markings and old log paths placed in spots along the way. But even with these cues, I’d lost the trail a number of times. When I doubled back, had a rest and re-looked at things fresh I was able to get back on track. Around three in the afternoon I got totally befuddled by a sign that seemingly pointed nowhere. In retrospect, I was tired, nervous about getting to water and camp, and my judgement was out of whack. But this was my first real what the hell do I do here moment. As I pulled up my dacks from a toilet stop I caught the top of a semi-trailer zooming past in the distance. My first thought was a hope he hadn’t caught my bare bum. Then it struck me that the highway was just on the other side of the scrub. I rambled through to get to the road, thinking that I could reconnect with the trail from one of the short walks that came off the highway. As soon as I just started putting one foot in front of the other without having to cogitate, I realised how knackered I was from carrying 17kgs, but also from the pressure of navigating. Being later in the day I decided to take the reliable road route to camp, scrambling in to discover that the water there was not drinkable. Rookie mistake. Compared to the solitude of the Salt Creek Camp the night before, this one was frequented by 4WD van types who were here for the beach dunes and ocean fishing. They were well supplied with H20 and generously topped up my supplies and drove me across the dunes to the ocean. Next week I’m off to Tasmania. No catching a lift on that route. P.S. Diabetic award of the hike to my new AARN body back, which has an easy access front pocket aka ledge to grab and lean on, to test blood sugar without having to take any off any equipment or sit down etc. Good one, Nat! Glad that you didn’t push to the extreme. PS. Nice pedicure. Yeah, no nail polish remover for that. Might loosen the boots a bit next week. 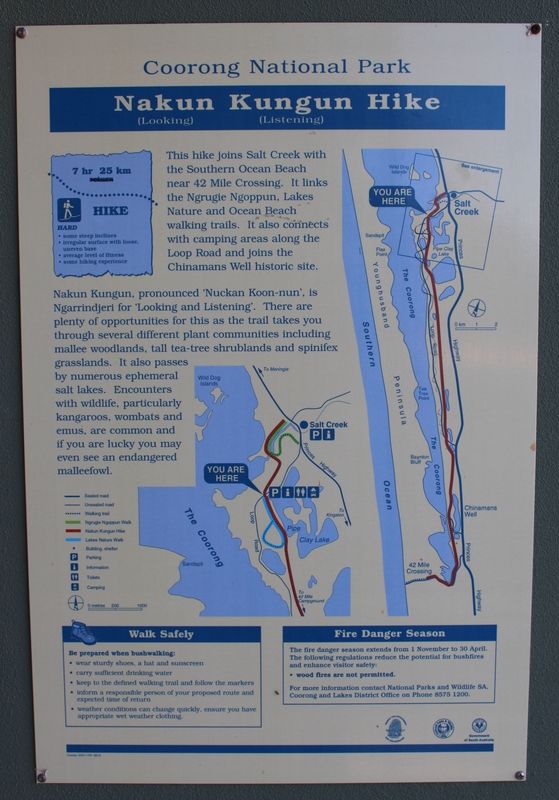 This entry was posted on 02/04/2014 by njd1insulin in Uncategorized and tagged 4WD, Coorong, diabetic, dunes, hike, Murray River, Nukan Kungan hike, South Australia, Southern Ocean, Type 1, walk, Younghusband Peninsula.